Halloween is coming up quickly and the final days to prep for all those Halloween parties has arrived! Have you planned your treats? Have you picked some perfectly spooky Halloween recipes to delight your friends and family? I know I've got a few tricks up my sleeves (oh, I just love this time of year!). Today I've teamed up with Avocados From Mexico to tell you about a fun Pin to Win contest they're hosting on pinterest. There are TEN $100 gift cards up for grabs, so you definitely should go enter! You can read all the details of the Pin to Win contest on their facebook page, but hurry, the contest ends on Monday! 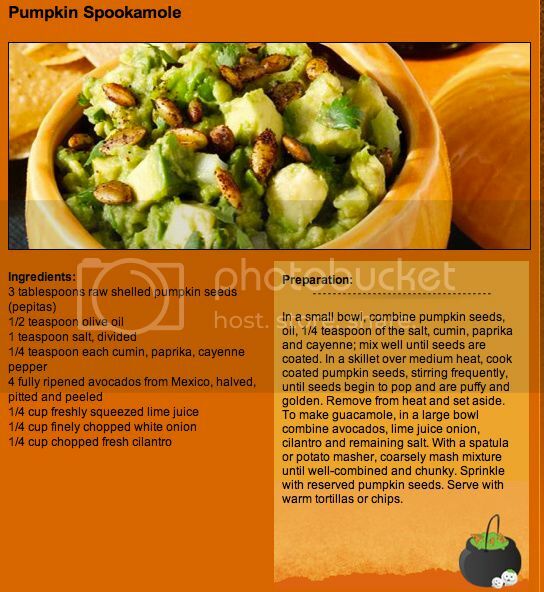 I love love love guacomole and when I found this "Spookamole" recipe with a Fall twist (hello added pumpkin seeds! ), I knew I'd found my perfect Halloween appetizer. Yum! I've pinned this and other delicious Halloween recipes and ideas to my Ghoulishly Green Halloween board example. What else is on my Ghoulishly Green Halloween board example? So many fun Halloween recipes and ideas!! If you're looking for more for more fun ways to Green your Halloween, check out Green Halloween (Green Halloween is a registered trademark of Green America). Honestly, with top-class chef book-worthy recipes like that, who needs the prize? The food itself is more than enough reward.